Use a grapevine wreath base to simplify DIY decor. 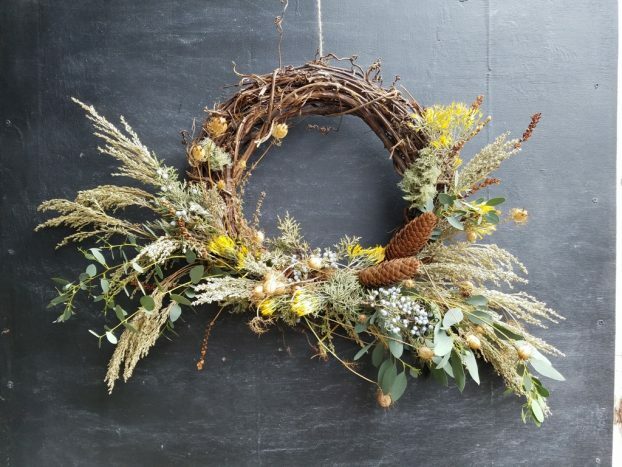 Beth Syphers of Crowley House Flower Farm in Rickreall, OR, taught her student Kaylean Martin how to create a lush harvest wreath with foraged greens and more. 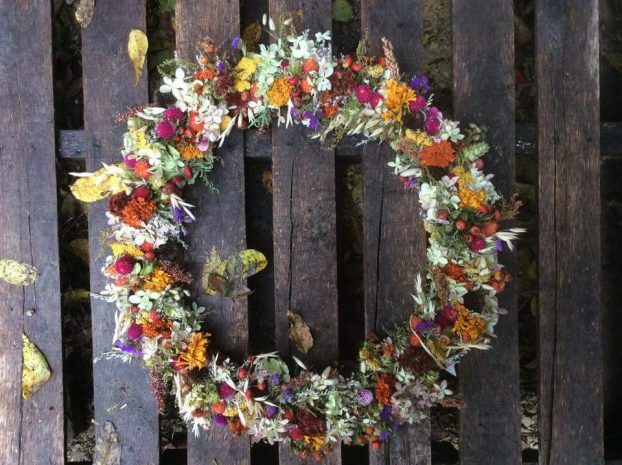 Rediscover dried flowers as they extend the harvest when winter arrives early, such as in Mt. Horeb, WI, where the Larsen family operates Sunborn Flower Farm and Florist. 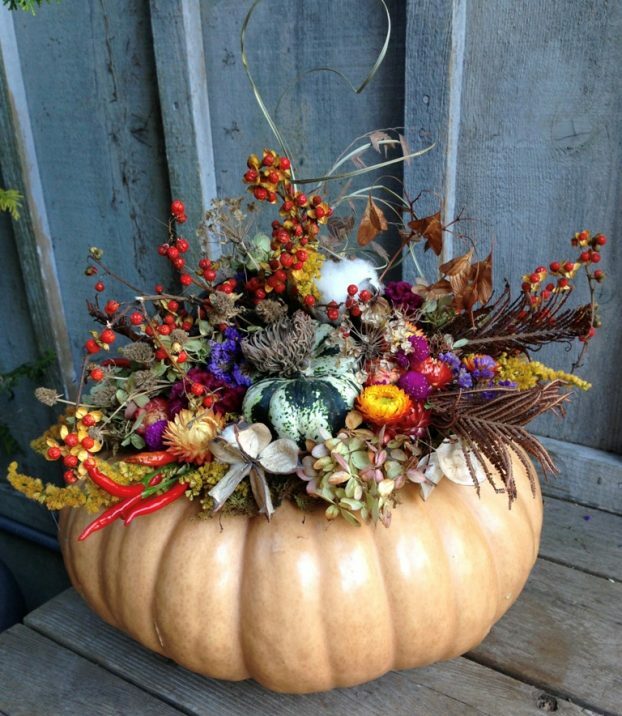 Put a twist on the ubiquitous carved pumpkin, cornucopia filled with gourds, or poinsettia plants wrapped in plastic and take inspiration from America’s flower farms, fields and meadows when you design for harvest, home and holiday, say members of Slowflowers.com. NOTE: This is the first of six Editorial Packages that Slowflowers.com will produce in the 2016-2017 season. 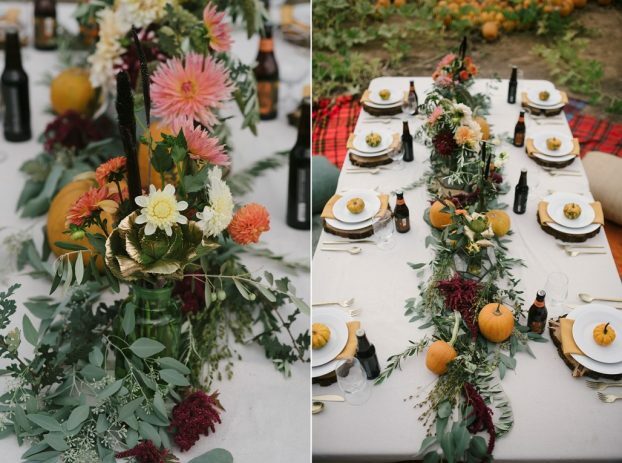 Instead of predictable designs or palettes of the past, creative flower farmers and florists suggest fresh and unique seasonal options such as adding hot peppers or ornamental kale to autumn centerpieces or “planting” pumpkins with succulents for harvest tables. 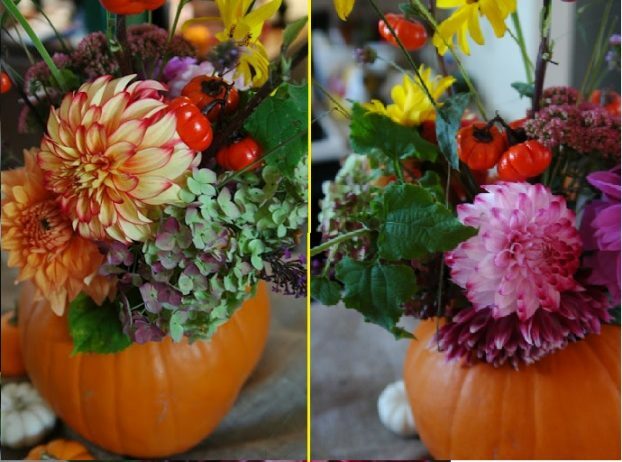 Use everyday pumpkins as vases for seasonal flowers. Deb Bosworth of Dandelion House Flower Farm in Plymouth, MA. 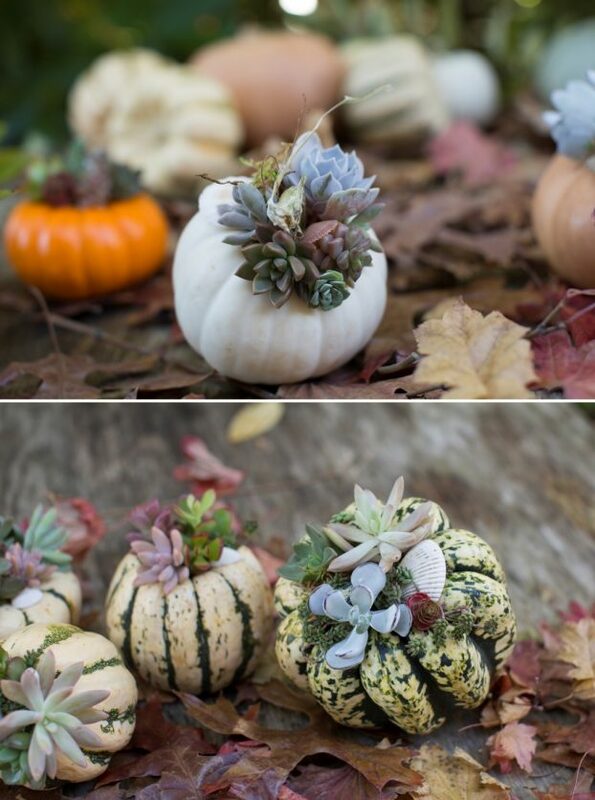 Embellish novelty pumpkins and ornamental gourds with succulents and seashells. Kathleen Barber of Erika’s Fresh Flowers in Warrenton, OR, suggests beginning with an unusually colored or textured pumpkin. Decorate edible pumpkins with dried flowers. Jane Henderson of Commonwealth Farms in Concord, N.C., decorates pumpkins with foraged and dried flowers, feathers, seed heads and pods, creating a long-lasting harvest arrangement that is far easier than carving. Come December, Slowflowers.com designers say “Season’s Greetings” is best communicated with updated florals, including snowy white palettes or traditional red-and-green bouquets containing elegant lilies. Create a snowy scene with whites and silvery hues. 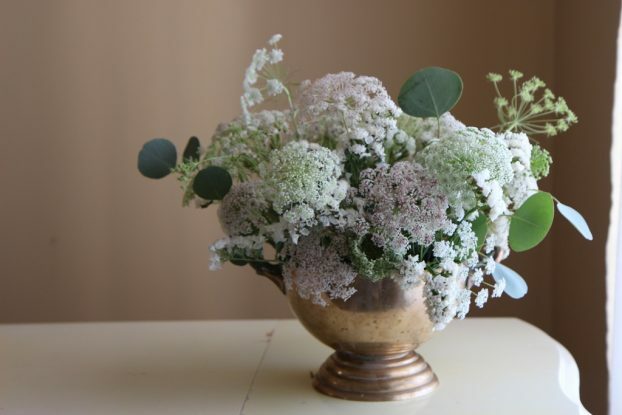 Betany Coffland of Chloris Floral in Sonoma County, California, designed a winter-themed arrangement using white and pink Queen Anne’s lace, white statice and silver dollar eucalyptus foliage. Add scarlet leaves and ornamental grains to convey autumn’s rich palette. Hannah Morgan of Fortunate Orchard in Seattle, WA, tucked vibrant foliage from local maple, oak and liquidambar trees into seasonal centerpieces. Transform the holiday table, front porch or fireplace mantel with local and seasonal flowers. Nothing is fresher or more long-lasting than just-picked botanicals.The best harvest, home and holiday florals begin with the source, says Debra Prinzing, founder and creative director of Slowflowers.com, which promotes American grown flowers. Use touches of gold to add sparkle and surprise. 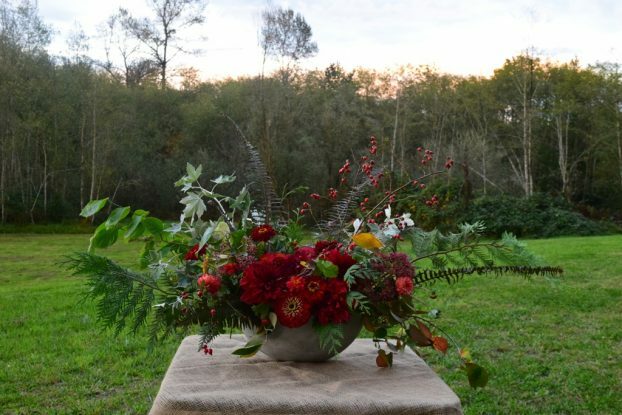 Laurie Garza of Fleurie Flower Studio in Reedley, CA, designed a warm, cozy fall table with dahlias, zinnias, hops, sorghum, bunny tail grasses, celocia, poppy pods and amaranthus from local California flower farms and greenery from her cutting garden and a friend’s property. Slowflowers.com, the free, nationwide, online directory to American Flowers, surveyed its members across the nation and collected some of the best design ideas for harvest, home and holiday.
. Make a centerpiece sizzle with hot red peppers and golden sunflowers. 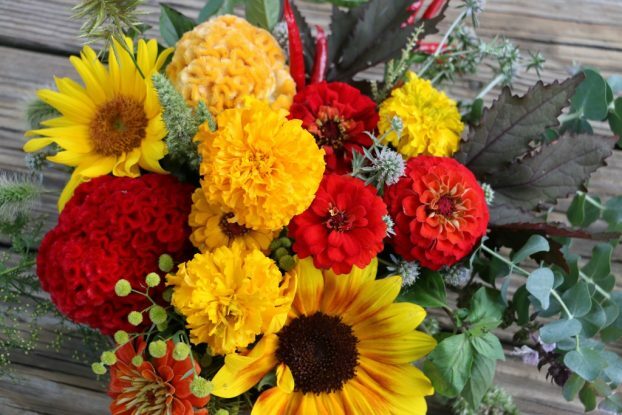 Andrea K. Grist, of Andrea K. Grist Floral Designs in Lees Summit, Missouri, celebrates autumn by pairing sunflowers and peppers with golden marigolds and crimson zinnias and celosia, along with herbs and greenery. Combine warm and cool floral colors for a surprising palette. Tobey Nelson of Vases Wild in Langley, WA, designs with a fresh mix of ingredients not typically associated with autumn. Ornamental vegetables are tasty to the eye. Go for unusual produce choices like black chili peppers and decorative kale, used in an oblong centerpiece perfect for a rustic farm table. 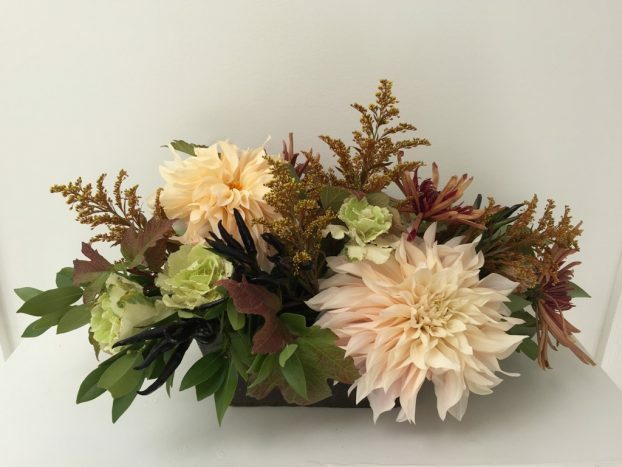 Moriah Harris of Portland’s Sellwood Flower Co. began with a traditional palette of autumnal spider mums, laurel bay, solidago and viburnum foliage and added dashes of creamy peach Cafe au Lait dahlias to lend sophistication. Reds and Greens transition from harvest to holiday. 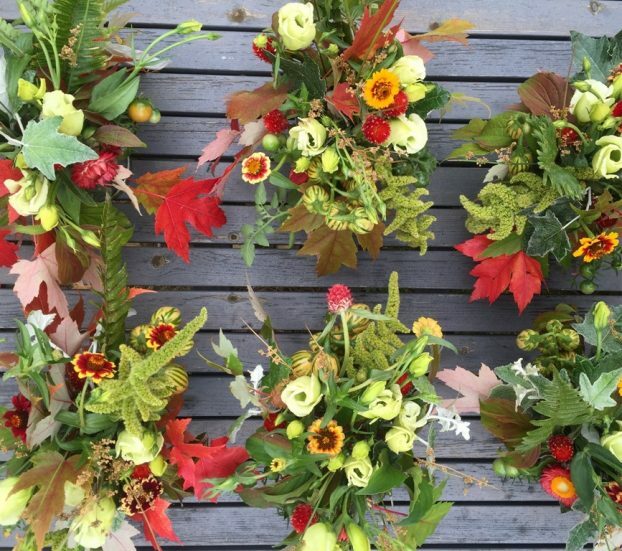 Tammy Myers of First & Bloom (Issaquah, WA) loves red and green for autumn floral decor — she says the palette hints that winter’s almost here while allowing her to use the last blooms and greenery of summer before leaves turn to gold. 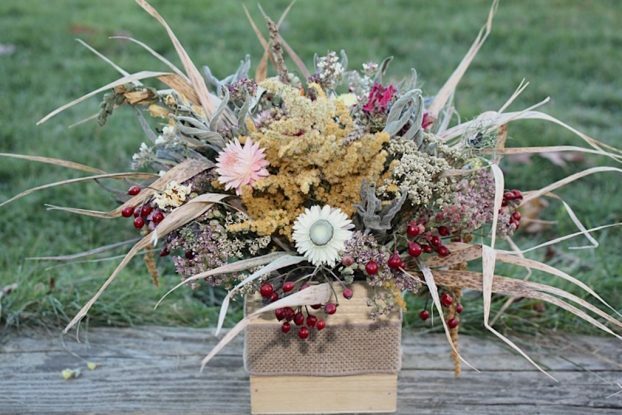 Radiate earthly elegance with dried flowers, grains, hips and grasses. 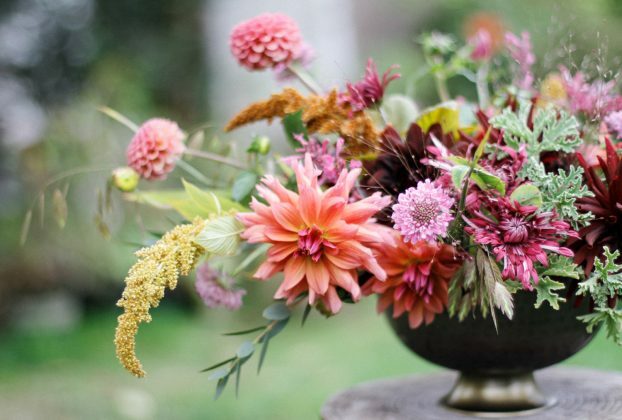 Rebekah Mindel of Meadow Wilds Botanicals & Floral Design, gathered a pastel array of earthy colors — tans and rouge, sage and cream — in a dynamic textural centerpiece. Burnished orchids and succulents communicate a modern autumn vibe. 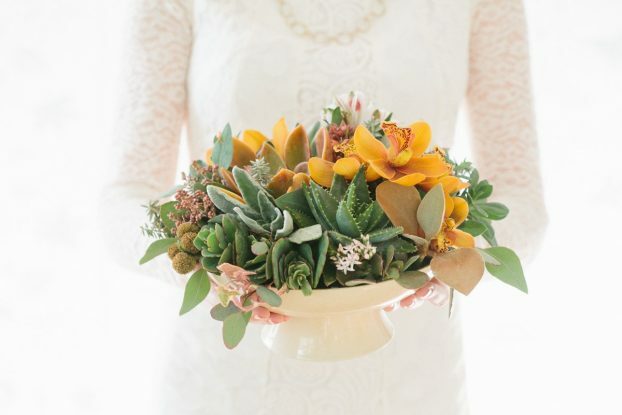 Margaret Lloyd of Margaret Joan Florals in Santa Barbara, CA, interprets the season with a decidedly contemporary point of view. 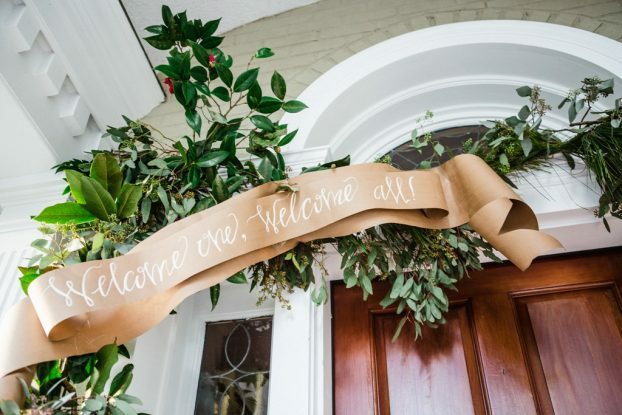 Entertain holiday guests with a greeting that trims the front door. Christy Hulsey and Amanda Currier of Colonial House of Flowers in Statesboro, GA embellished the front door with a garland of local greenery and berries that last the entire month of December. Incorporate greenhouse-grown lilies with traditional holiday greens and holly berries. 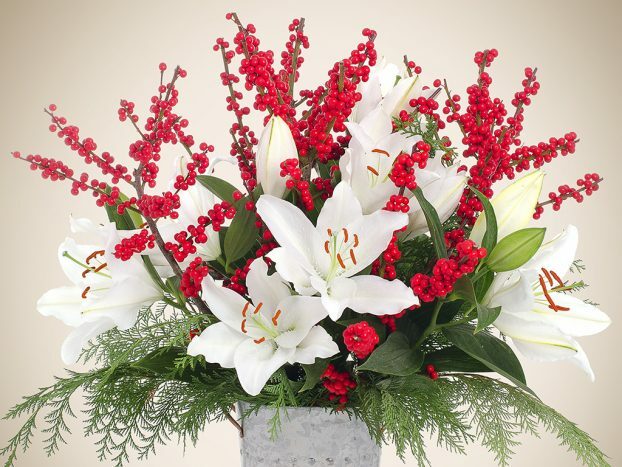 Stargazer Barn’s white cup Oriental lilies are a breathtaking addition to festive berried branches and fresh cedar boughs reflecting the spirit of the season. This entry was posted on Wednesday, October 26th, 2016 at 7:35 pm	and is filed under American Grown, Creativity, Entertainment, floral design, Flower Farming, General, Slowflowers.com the Directory of American Flowers. You can follow any responses to this entry through the RSS 2.0 feed. You can leave a response, or trackback from your own site.